As college admissions become ever more competitive, with the most elite schools admitting only 4 or 5 percent of applicants, the pressure to exaggerate, embellish, lie and cheat on college applications has intensified, admissions officials say. Sally Goebel was working in admissions at the Wharton School of the University of Pennsylvania when an applicant submitted a moving essay about his mother’s death. He was admitted. Just before school began, someone from the university called his home and a woman answered the phone. She was the student’s mother, alive and well. “It was kismet,” Goebel, now head of Selective Admissions Consulting, said, still shocked by it years later. “There wasn’t any strategy there, and we didn’t suspect him.” His admission was revoked. A recent New York Times investigation found that the leaders of T.M. Landry College Preparatory School, a private high school in Louisiana, doctored transcripts and fabricated up-from-hardship stories on college applications in a systematic effort to land students at selective universities. The revelations have highlighted critical vulnerabilities in the admissions process and cast doubts on a system that some officials and consultants say inadvertently invites exploitation. In the Landry case, school officials made up tales drawn from racial stereotypes, with the aim of enhancing a student’s chances of admission. But universities that encourage students to write such hard-luck stories, experts say, share the blame. This is the time of year when high school seniors are starting to see the fruits of those labors. Some students are just finding out about early decisions; others will be sending in their applications in the next few weeks. Admissions officers and consultants said that the kind of outright fraud in the Landry case was rare. But with colleges receiving tens of thousands of applications a year, it is virtually impossible to check them all for cheating, officials said. They said they do not routinely put essays, for example, through plagiarism checkers. Instead, they rely on experience, intuition and the honor system. It is not a foolproof process. James Arthur Hogue, a serial impostor, got into Princeton University in 1988 by posing as a self-educated ranch hand. He ran on the track team and was admitted to an exclusive eating club before being unmasked. Short of outright fraud, popular culture has glorified the hardship story in college admissions, persuading many students to make it an essential part of their application. A well-publicized 2010 memoir by Liz Murray, for example, was subtitled, “My Journey From Homeless to Harvard.” The online Common Application, used by more than 800 colleges and universities, taps into that vein. It encourages students to write about overcoming obstacles and to share “a background, identity, interest or talent that is so meaningful” that their application would be incomplete without it. The Common Application asks students to certify that they are telling the truth, but does not try to independently confirm that they are. It is up to colleges to take that extra step, said Daniel Obregon, a spokesman for the Common Application. Some universities require students to sign a sworn statement that they are telling the truth, under pain of prosecution. But officials admit they are not seeking to be law enforcement. Mainly, officials and counselors said, they look for inconsistencies. Do standardized test scores and grades match? Do certain words and phrases in an essay jump out as being in the vocabulary of an adult rather than a teenager? Are a student’s extracurricular activities too good to be true? And they depend on high school counselors to give them honest appraisals of students who are applying. “If each component is not all pulling in the same direction, it becomes a kind of red flag,” said Katharine Harrington, vice president of admissions and planning at the University of Southern California. As at Landry, the officials said, it is often the adults, not the young people, who have the temerity to manipulate the application process. Jim Rawlins, director of admissions at the University of Oregon, said that he always looked at essays with a grain of salt, but that checking extracurricular activities was rare. “If they say they were on the football team from ninth to 12th grade, who’s going to check it?” he said. But Rawlins defended the system. “I love that we’re a profession that assumes, more of the time than not, you can trust what students turn in,” he said. Foul play can be hard to prove. Scott Burke, undergraduate admissions director at Georgia State University, knew something was amiss when the birth date on an application was far too old to belong to the high school student who supposedly filled it out. With a little sleuthing, his office discovered that it was a parent’s birth date — the second time that Burke had seen this particular slip in his 10 years at Georgia State. “All of us sitting here looking at those applications came to that thinking that the parent likely filled out the whole application,” Burke said. But they could not say for sure whether that was the case, and after contacting the student, they gave the family the benefit of the doubt. Just how much parental help is allowed is rarely made clear. “If it’s not fundamentally changing the thinking, or if it’s expounding on a place where you have writer’s block, I have no problem with that,” Burke said. “It’s honestly not too difficult to sniff out an essay that’s just kind of made up,” she said. Colleges can revoke admission for applicants found to have lied, but the Landry case has raised the uncomfortable question of what to do when adults are primarily to blame. St. John’s University, one of the colleges that accepted Landry students, said it was offering support, not meting out discipline, to those students. “Student wellness and the ongoing personal support of our students is an essential part of the Catholic and Vincentian mission of St. John’s University,” Brian Browne, a university spokesman, said. 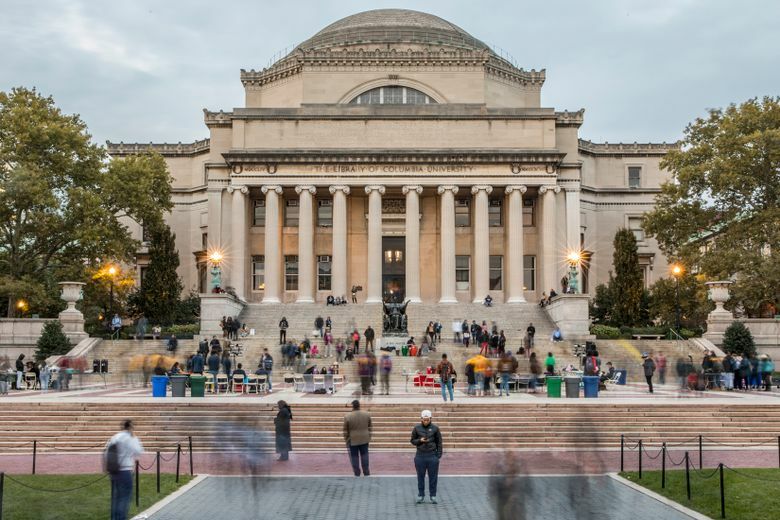 Plenty of students resist the temptation to embellish or go for pity and succeed, said Debra Felix, a former assistant dean for admissions at Columbia who is now in private admissions consulting. Felix said one of her students, who was just accepted to his first choice via early action, had written an essay about a canoe accident that he was blamed for. He is black and was raised by a single mother, but he did not discuss race in his essay, she said.